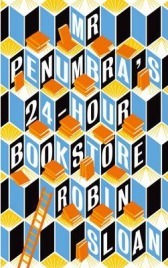 When I first received a copy of Robin Sloan’s Mr Penumbra’s 24-Hour Bookstore, I thought there had been a mistake. The title reminded me of the sort of book that I read when in primary school, albeit with an American slant to it. I sat down to read it with the return letter for the publisher already forming in my mind…and was soon hooked. In the middle of recession-hit San Francisco, we meet Clay Jannon, a young and newly minted addition to the city’s unemployment figures. With only a few months’ work as a web designer on his CV and companies closing left, right and centre, he is struggling to find a new job and rapidly running out of money. One afternoon, as he walks around his neighbourhood dropping off resumes with anyone who will take them, he notices a small shop he has never seen before – the eponymous 24-Hour Bookstore, a store “absurdly narrow and dizzyingly high” with a forest of bookshelves and a help-wanted sign on the door. It is not long before Clay finds himself appointed night clerk in what is quite possibly the oddest book store in town. At the front of the store sit a few shelves of regular books; every now and again somebody wanders in from the street and buys one, but not nearly enough to keep the store going. Further back, mounted on impossibly high shelves, seems to be the real purpose of the store, what Clay dubs the “waybacklist” of books, leather bound and only accessed by a certain group of visitors who seem to be members of some strange book club or secret library who borrow, but never buy, these books: “they arrive with algorithmic regularity. They never browse. They come wide-awake, completely sober and vibrating with need.” Clay must issue these books, record the transaction in an archaic hand-written log and never, ever open one of these books himself. Needless to say, it doesn’t take long before Clay breaks this rule and sneaks a peek inside one of the strange books after making the profound discovery that they do not exist in Google. If you had shelves of unique, secret books mere feet from you for hours at a time, wouldn’t you be tempted too? It won’t surprise you overly to say they are written in code or that Clay tries to break said code using his laptop during his long and largely customer-less shifts. However, he does it is a slightly more modern way than the scholars who more usually pore over these tomes. Armed with the technological know-how of a software designer friend and a girlfriend who works at Google (it had to be set in San Francisco for a reason), Clay sets about unravelling Penumbra’s mystery for himself. Mr Penumbra, and the book’s origin in a short self-published Kindle story seems to have been taken as licence by some people to be a bit sneery about it. Yes, at times it does feel like an extended short story rather than something designed as a novel from the outset. Yes, there are some digressions that don’t move the plot on and may just be padding things out a bit. Yes, it is short for the number of ideas that are crammed inside its covers. Yes, the origin of some of the puzzles is never adequately explained. But I don’t care. Clay is a charming narrator and the book has the feel of a wonderful story told to you over a cup of coffee by a best friend, and it is only when thinking back afterwards that I noticed these little flaws. When I was reading it, I was just happily swept along by the story. Mr Penumbra is a literary adventure story for the 21st century, enjoyably meshing the traditional world of real books and old knowledge with the modern world of Google, Kindle and data visualisation while including proper adventure staples like secret cults, codes and clandestine missions. There are some fascinating observations and genuinely funny elements, and I loved the writing. But you know the best part? For all the power of technology it quickly becomes obsolete, whereas books continue to hold power over us five hundred years after being invented, and show no sign of stopping anytime soon. With thanks to the publisher for providing this review copy. 2 Comments on "Mr Penumbra’s 24-Hour Bookstore"
I wholeheartedly agree, despite its commercial origins there is deeper and valuable meaning to be found in this very enjoyable read. I loved how it ‘it embraces the transience of modernity’ (my review).